The acclaimed author Sandy Tolan was in Palestine, researching for his upcoming book The Lemon Tree. He saw a poster with two images, left side was a raging young boy throwing a stone (toward an Israeli soldier), the right photo was the same boy, now a teenager, playing the viola. Sandy was fascinated by this and had to know who he was. He tracked down Ramzi, who was raised by his grandparents in a refugee camp. Ramzi told him he wanted to start music schools in refugee camps across Palestine. Ten years later, they randomly reconnected, and Ramzi had done exactly that, starting schools in Gaza, the West Bank, and Lebanon. 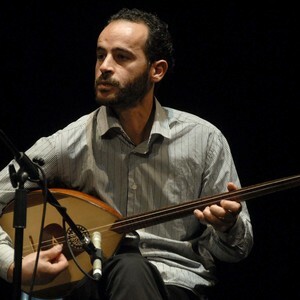 Other musicians joined Ramzi's cause (from Morocco, Tunisa, England, America) and they now form the Dal'Ouna Ensemble, including one of his past students even. Meanwhile Sandy has released another book, focused entirely on Ramzi/what it's like growing up in a refugee camp. The vast majority of the performance is music, Tolan notes. He simply introduces the evening to provide the framework and reads an extract from the book. This is Middle Eastern classical/chamber music with a bouzouk, an oud, percussion and an accordion. Transformation. A dream about the power of music that became reality. A story of perseverance and, above all, hope. For one evening, at least, it’s a chance to step into another life as the Dal’Ouna Ensemble plays and Sandy Tolan speaks.